The 2000 wet series is the epitome of heavy duty, Duplex professional machines that have been giving users their best performance for more than 20 years. Like the full range of wets the 2000 series has been enhanced be increased efficiency in terms of wet pickup - working better and quicker than ever before. Accessories supplied are to full 38mm (11/2”) standard. • Ease of Transit - Multi-site use with large rear wheels and pull handle make for light work. • Built to Last - Heavy-duty Structofoam head construction and steel external chassis. • A Tool For Every Job - Professional Industrial accessory kit with stainless steel tube set. • Unrivalled Performance - Equipped with long-life TwinFlo 2-stage bypass motor. 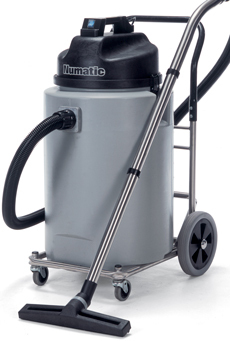 • Stay Cleaning for Longer - Huge 70L wet capacity and 26.8M cleaning range.